This is the final post in this series and I'm kind of sad it is ending but I have thoroughly enjoyed writing these posts. The final one is about my blogging experience so far. I have been blogging for about 7 months now and to think I've been logging for that long is crazy! I remember being a curious 14 year old, wanting to read a lot more and start something new, and after reading a few blogs, I began to consider making my own blog and I remember in December last year, writing my first posts as drafts in my notes on my iPad. However, it took me 2 months to make a blog, but I didn't post until the end of March. Since then, I have collaborated with a few bloggers and done my own blog series, and I have to say I love talking to other bloggers and also reading their blogs! I have to say that it is probably my favourite thing about blogging: connecting with other bloggers and giving them support! I am so excited to be back with another monthly favourites post and this month I have had a lot of favourites! These are my favourite posts to read and write and always look forward to them!! I'm going to start by sharing some apps I have been loving, and I rarely share my favourite apps because I don't think "Wow! They are amazing!" like I do with other things, but this month I have had two. The first is Pinterest, which has been a favourite of mine for a while now and this month I have used it more than ever! The second is Sandbox and this is like a colour by numbers app, and I just love it as it keeps me occupied on my bus journeys to and from school! There are 1000s of designs so you can colour anything from Nutella to a stick insect!! I'm on the far right! It's Halloween again, i.e. my favourite time of the year!! And because it's Thursday, I've decided to do a huge Halloween throwback and reveal me, aged 7, at Halloween! When I was younger, my auntie used to hold Halloween parties almost every year and from what I remember, I loved it! I would pretty much always dress up as the same thing every year, so for about 4 years, I was a witch! My sister and I both went as the same thing too, meaning we pretty much looked like twins. We'd have too many sweets, meaning we were bouncing off the walls. Literally. As well as this, we'd play all the games, do all the dances, and our favourite thing to do was play hide and seek with my two cousins! One thing I never really did though was go trick or treating, so can you all tell me whether I'm missing out on anything haha! Today I'm back with my third installment of my 'A Bit About Me' series, and this one is all about my style. My style recently has changed a little bit, and I've started to wear outfits that are a bit more out of my comfort zone, but then again, I've loved being that bit more daring! In terms of my style inspirations, I have a few and they are all on YouTube. They are: Olivia Grace, ItsAilish, and Grace Shadrack from Grace and Grace (the blonde one!). I really like the styles of all 3 girls, I think they are so sassy, cute and a bit badass, which I like. Currently, my favourite items to wear are: hoop earrings, my New Balance trainers, black jeans and my cut out band tee. I think that some of these items completely transform my look, and it adds to the sass! Autumn is officially here!! I feel like I've said this soooo many times already but I'm way too excited!! I'm back today with a makeup post, and I love writing these. Recently I've been wearing a orange smoky eye which I have been loving!! I took the Rimmel Lasting Finish Concealer to prime my eyes and get rid of any veins, before taking the 1st shade down and the 1st shade across to set that in place. I took a light brown orange shade as my transition shade and placed this in my crease. Then I added a bright orange shade in my crease, before adding a darker orange on my outer 3rd and I blended this all out. I took the bright orange shade across my lid as I am going to make it more smoky the closer I am to my top lash line. I decided to put a darker shade in my outer third, and blended this a little so it wasn't so sharp. The next shade I took was a dark reddy orange colour over 3/4 of my lid, keeping the orange really bright in the crease. I'm back today with a different post and it's something I've never written before, and it's my favourite books. I don't read as often as I should but I have read a fair bit recently so I am recommending my favourite books to you. This book is incredible. It is so heart-warming, and follows the story of Maddy who battles SCID, a rare illness which permits her to leave her home. She meets a boy next door called Olly, and Maddy's world suddenly changes. I felt such a variety of emotions whilst reading this book, and it was emotional but I didn't cry. Not a lot makes me cry. It is a mature book so I recommend this to 12+. Also, after seeing the film twice, i can say that the book is better in my opinion, but the film is amazing! My second topic of this series is one I am very excited to write about and it's dance. What most people on the internet don't know about me is that I dance, and I have done ever since I was 6, so it's been about 9 years, and it has been such an amazing 9 years. I don't take all the traditional styles: jazz, modern, ballet, tap etc. My dance school is a freestyle school, which means we do a variety of dance styles, my favourite being slow/contemporary. I think it is very expressive, and I am fairly flexible, so I find the moves quite simple. My teachers are incredible too, I take 2 classes a week: my weekly class which I've been at since I was 6, and also a stretch class, which has really improved my flexibility. I would not have learned all the techniques and tricks without my teachers. This has also helped me in my dance for my GCSE PE, allowing me to make my own dance up, with tricks and technique. 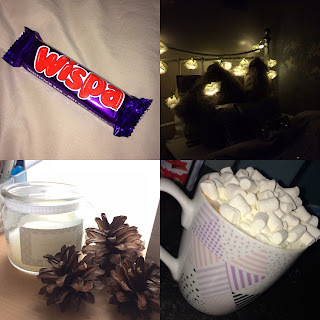 The cozy season is back, and we all know what that means... fairy lights, fluffy socks and the return of hot chocolates!! And every now and then, on a Friday night, we all need a good pamper don't we?? So today I'm telling you what I do on a typical pamper evening. My pamper evening usually starts about 6:30, when I have had tea/dinner with my family and I have done all or most of my work I need to do for school. The first thing I will do is take off my makeup if I haven't done so, and for this I just use a Simple Cleansing Wipe. I light a candle, and the one I have been loving at the minute is White Jasmine from Next, and put on my fairy lights. I then get a face mask, and to be honest, I rarely use face masks, so I never have any in, however, I went out and bought one because I need to start treating my skin better. I bought the Chocolate Coffee Mask, I can't remember where it was from, but it made my skin feel so so smooth! I really liked the last OOTD post I did, which was my "Slogan Tee & Hoops" outfit, so I decided to do another post, this time it's more of an edgy look which is a little out of my comfort zone but I loved wearing it! Once again, a thank you to my little sister Elisha for taking the pictures, and I returned the favour by taking some pictures for her Instagram! The top I am wearing is from H&M and I got it a while ago, so I can't link it but it is a Black and White High Neck Crop Top, which is made from a thin material which is nice when transferring into autumn, as it can be layered, however it was a warm day when I took these photos, so I didn't wear a jacket or anything like that. I have used this picture before, but I'm really not sure what picture to use, so I've used this again, sorry! Welcome to the 1st post in my new series, "A Bit About Me". The first topic I want to cover is school because we all go to either school/college or uni (well most of us anyway) and it's something I have wanted to talk a little bit about. So here's some background knowledge: I am currently in year 11 at my school, and I took these options for GCSE: PE, Textiles, History and French (which was compulsory for the top band, i.e. the more academic students). I do like my school, even though most people say they hate it, in all honesty it's really not bad at all. I do like all my teachers, which is a bonus!! Personally, I love autumn makeup. It is my favourite season to do my makeup in as I can wear oranges and reds, which I find suit my skin tone quite well! Just a quick disclaimer: I actually did this look in August!! My plans had got cancelled on a day, so I decided to create an Autumn look because it was kinda Autumn weather outside: rain. Photography is one of my passions, I adore it, and it's always nice to have an amazing Instagram feed, am I right?? So today I'm going to share with you some of my favourite pictures I've taken, some of which you've probably seen before on my feed! Music I Am Currently Loving! !